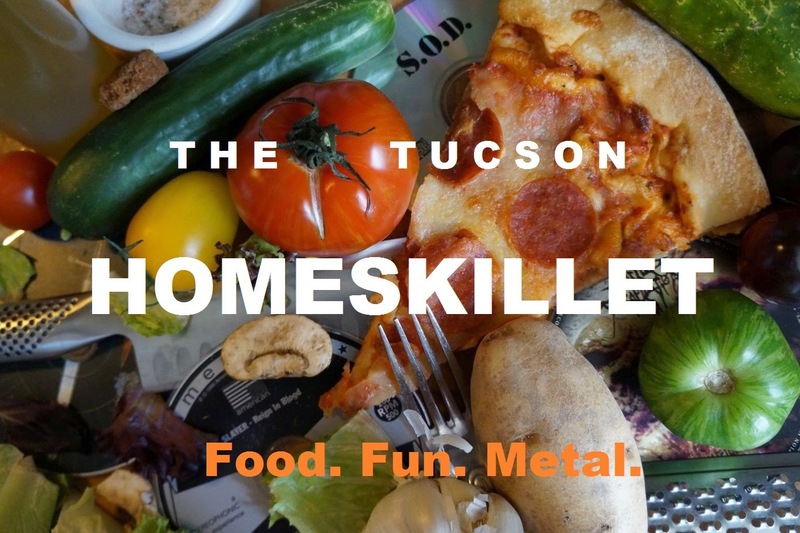 The Tucson Homeskillet: Spinning Meat, Bring The Heat! Spinning Meat, Bring The Heat! 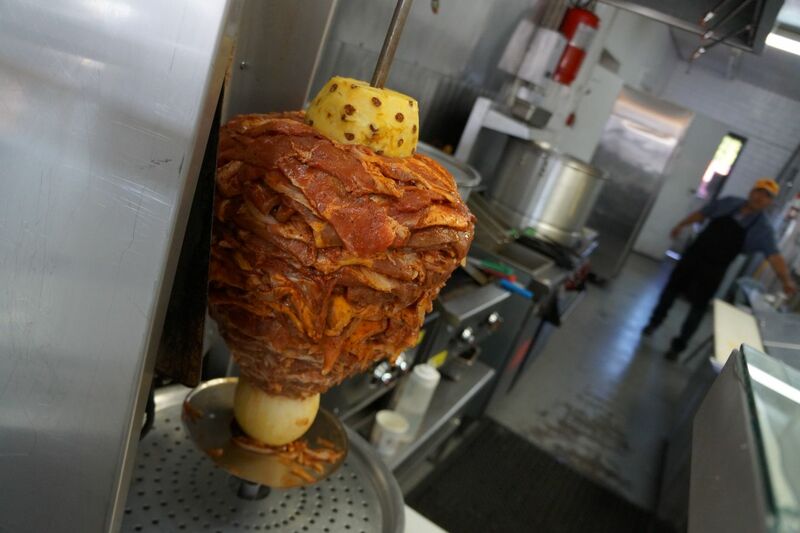 Officially trompo means "spinning top", you know like what kids play with. 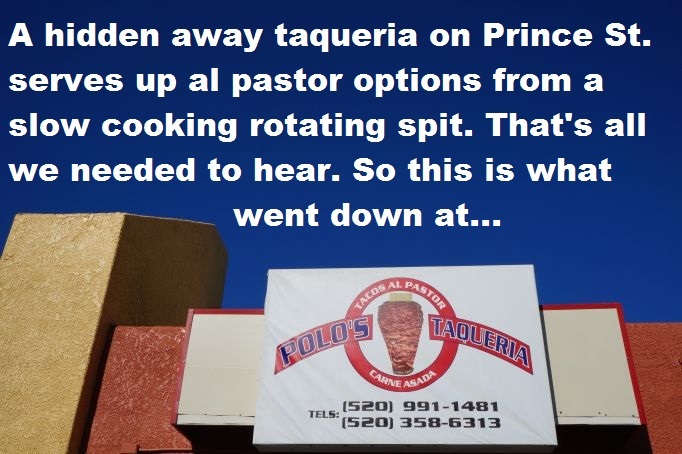 But in the case of Polo's Taqueria (918 W. Prince RD) it means a rotating meat girth of awesome. The owner, the restaurant's namesake (and no it's not pronounced pollo like 'chicken' but Polo, like the game, or clothing line or Marco's last name), is from Mexico City where this style of cooking meat is totally normal. 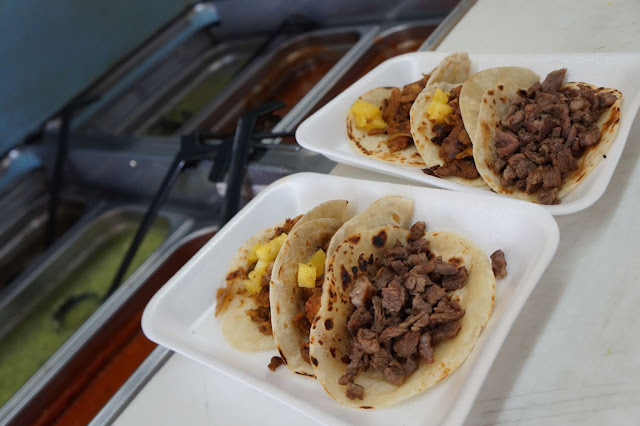 We are used to seeing beef and such cooked on a slowly rotating spit in Mediterranean or Greek restaurants, but here the flavored goodness that gets sliced up nice and thin right from the dripping tower of carne gets put on tortillas instead of pita. And believe us, this is the real deal. So ready to get down with this mess. It's a pretty inconspicuous place, in fact when we drove by it we, well...almost drove right by it. Located in a shopping strip, Polo's rests next to a laundry facility and if it wasn't for the big yellow banner out front with the words "HOT DOGS" written on it we probably would have kept on driving. Once inside you are treated to an extremely casual environment with a tight menu over the register area and festive music playing to get you in the chow down mood. 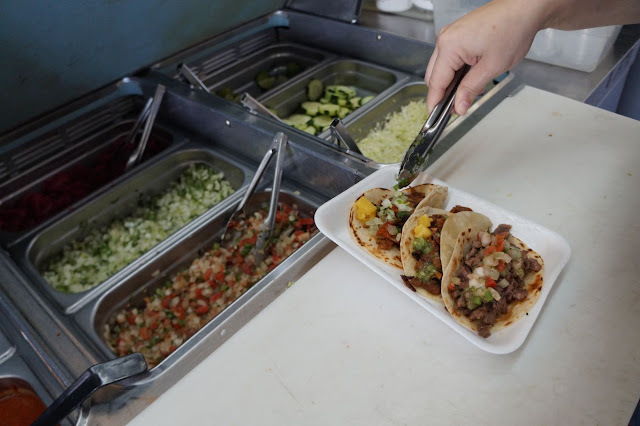 Polo's has all kinds of yummy offerings such as burritos, tacos, sopes, tortas, caldos and even a hamburger...like all good taquerias do and should. To the left you get to witness to the slow spinning beef mash that is topped with a half pineapple with an onion base. El Trompo! We almost got down on our knees to worship at the altar of revolving splendor. The prices are what you would expect, like almost 2 bucks for a taco, but it is the care and quality that you are paying for and these looked like they are fawned over with loving grace. 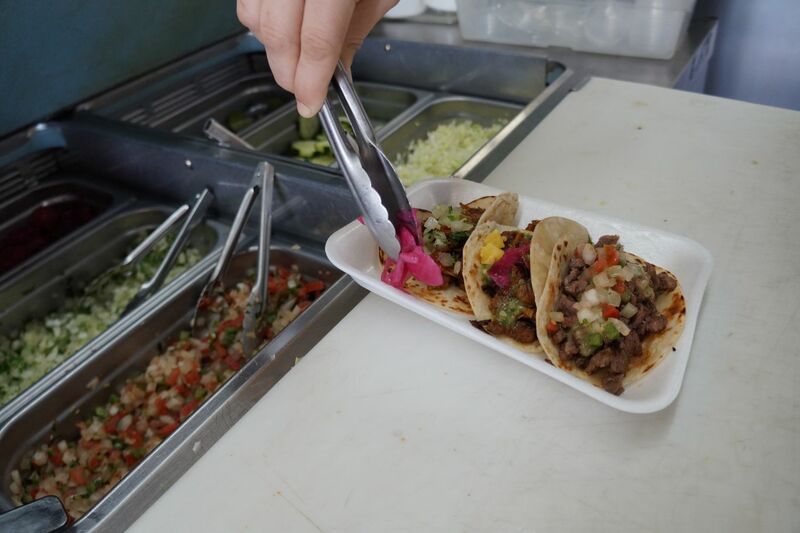 Plus our orders came out fairly quick, so that was good, because we were plenty hungry and ready to dive into the al pastor that was cut fresh right in front of us. Polo's has the requisite toppings and salsa bar and the lady running the front counter even came out and suggested how we festoon each item. That was really cool even though her English was almost as bad as our Spanish, but we got the gist. Not too sure if they were having refrigeration issues that day but the salsas and lettuce were way too cold and were a bit wilty. That is our only critique. Better that than being too warm and going all gush and limp. Whatever. 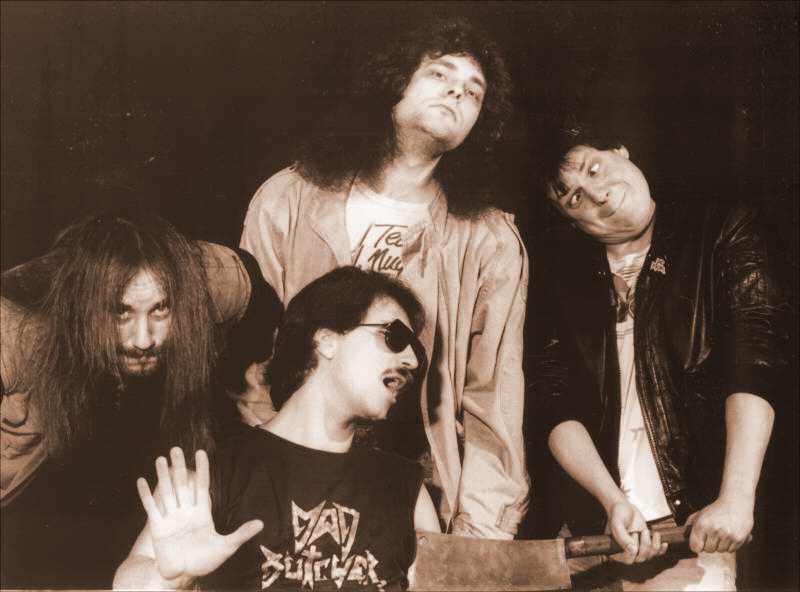 We are survivors. After we got all of the tacos, burros and sopes in check it was time to sit down and go for it. The al pastor was amazing. Really juicy and thanks to the fruit and onion infusion it took on a citrusy and savory whimsy. Everything was fresh and all of it, the chicken, the carne, the cabeza, the frijoles, etc, was delicious. Our favorite though had to be the sopes, which are basically mini taco salads made with a thick tortilla and filled with all sorts of wonder. These things ruled. 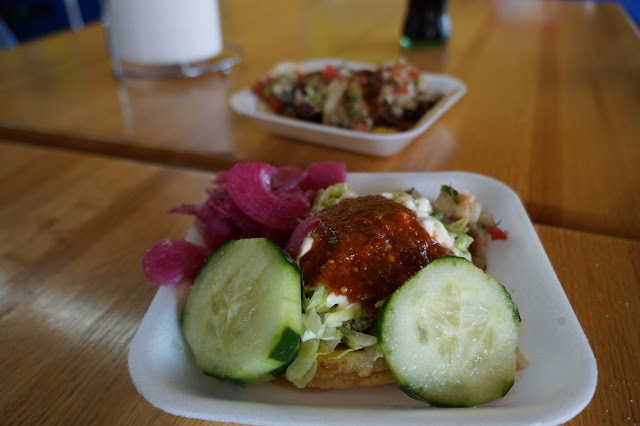 Maybe its because you can get a good taco or burro almost anywhere here in Tucson but a tasty sope is a bit of a treasure hunt. We struck gold here folks. Best thing is they are kind of heavy so when you eat one, or twelve, you know you are going to get filled up. We did not leave there hungry. Next time we visit Polo's we are definitely going to try the Cubano torta and a caldo which is a hearty soup filled with thick veggies and rustic cuts of meat. Can't wait. Now you know kids. Just keep your eyes open because you don't wanna miss the Mexico City radness of this place even though you need to kind of look for it. And everyone was friendly too. That is always a plus and seems to make things even tastier. I have GOT to come to TUCSON! ! Sounds authentic & yummy.